It’s time for me to admit that fall is here and winter is coming and it’s time to prepare the garden for it’s long winter’s nap. In my Zone 5b garden that could mean most anything as I’ve seen winters with more days than I care to count below 0 and then there are the mild midwest winters like last year. Regardless, good fall care makes spring all the sweeter. About 6 weeks before expected frost, it is time to stop fertilizing and deadheading the roses. Since in my neck of the woods, the first frost date can be anywhere from October 5 – October 28, I start the “stopping process” the first of September. 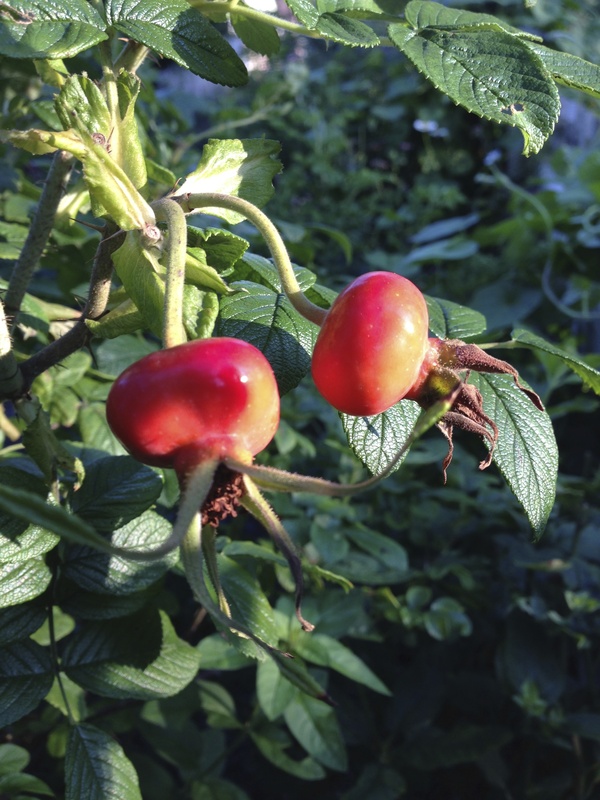 Stopping the deadheading process tells the roses it’s okay to begin to go to sleep and start producing seeds in the form of rose hips (Read more about rose hips here.). Don’t trim those off either–the birds find them particularly yummy. Remove all diseased leaves from around your roses. Black spot and other fungal diseases are not discouraged by cold temperatures and will just over winter and be there next spring– so they must go! Don’t add any of your diseased leaves to your compost pile … they will overwinter there too! 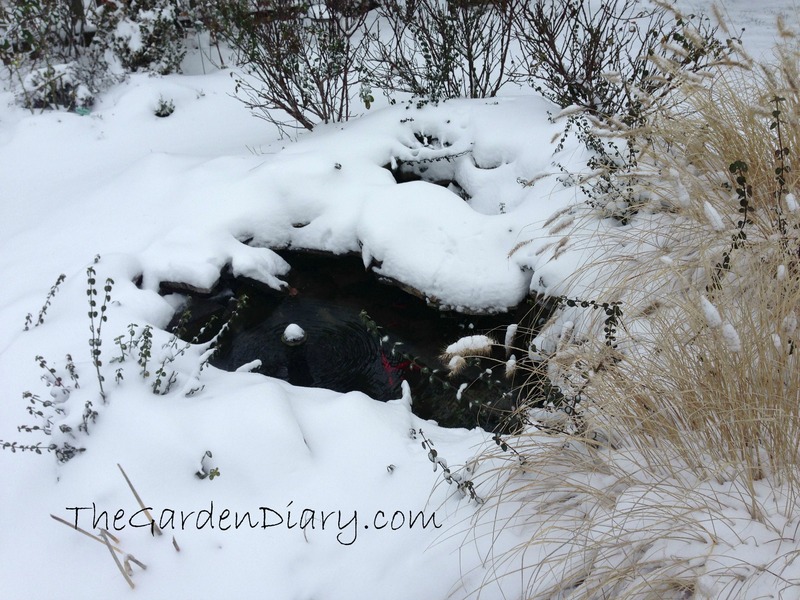 I don’t do much pruning in the fall (Read about spring care here. ), unless there are rose canes that have gotten extra tall or spindly. Those I trim back to prevent them from flapping in those cold winter winds as there is a danger of loosening around the roots and making the roses more susceptible to damage from the cold. I think it is very important to add an extra layer of mulch to protect the roses through the winter. And, for roses that are more tender, I will mound the mulch much higher on them–to about 1/2 the height of the shrub. Smashing good photo of those rose hips. And I love that you are counting the days till spring – even though your garden is lovely in the winter. Awesome post! Great tips to get ready for old man winter! Like it or not and ready or not … He’s coming! 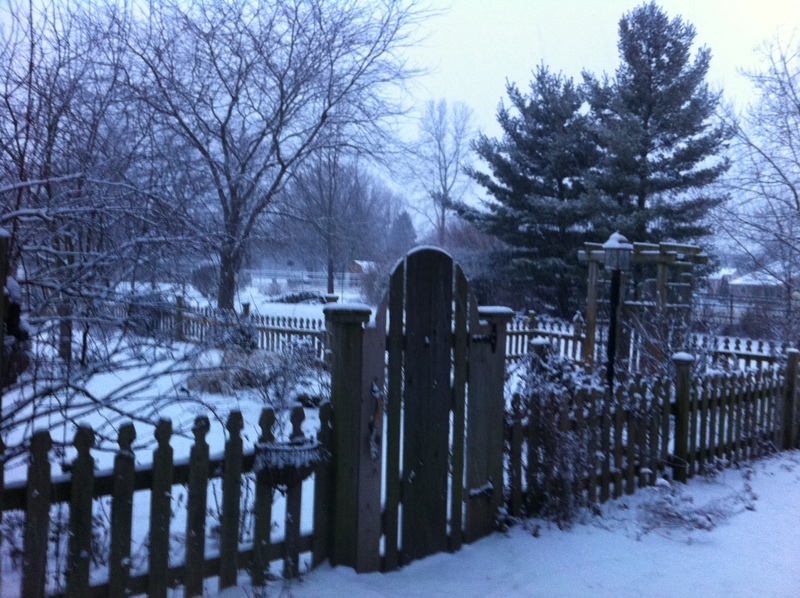 This first snow is pretty–then I’m ready for spring. That seems like a long long winter….some years here we could have cold nights but no frost till quite late in the year and sometimes Jan/Feb time….but these are getting fewer ,we all have to be prepared as you say….you just never know. Just in time T. Thanks. Enjoy fall clean up. I am out today to remove all peony stems as PM has had a party here this wet summer in zone 6. I stumbled upon your site earlier today and I am glad I did. Yours is one of the few websites that I’ve discovered that focus on gardening and are not ashamed to mention the Bible; your faith shines through these webpages. I am the developer and caretaker of the Gethsemane Prayer Garden in Syracuse, located on the grounds of my church, Faith Chapel. The garden is open to the public and is on a two-acre site. We have ‘Bonica’ roses at the center of the garden which as you know are a type of shrub rose, and a few ‘Knockout’ roses scattered throughout. My heart is taken with the picture of love as pictured in the ‘Bonica’ (http://www.prayergardeners.com/gethsemane/rose.html). I post these comments here because I have not yet figured out how to treat these roses over the winter. Last year the deer enjoyed the leaves during November, and they continued their munching until they were just 4 inches tall. Of course they came back, but there was an abundance of blind buds throughout this growing season. In earlier years they were mulched as you suggested, but the moles girdled many of the branches. One year they were covered with spruce tree branches, and that yielded over 100 moles that multiplied over the winter. This year our mole population appears under reasonable control, but I still am not sure what to do. We put a 6′ metal chain-link fence around a cluster of arborvitae and cedars which keeps out the deer. It is ugly, ugly, ugly, but maybe that’s what we need to do with the rose bed. Because the garden is a prayer garden and not just a pretty flower garden, I don’t like putting up too much structure around God’s creation. On the other hand, Syracuse NY receives over 100 inches of snow in most years which keeps people away, and sitting on a wooden bench on a very cold day is not for most people. Tom, because if your harsh growing conditions, I would recommend taking a look at my friend Jack’s site. He is located in Minnesota… http://jack-rosarian.blogspot.com/?m=1 Best wishes!!! I found Jack’s blog site very informative, especially his article on controlling the voles. I thought they were moles but I see he is correct. I will give his castor oil treatment a try this year. I also found his suggestions on cutting back the roses to 12-18″ and then mulching them to be good. I did that for the first 2 or maybe 3 years. It controlled the deer because they could not find the roses. I stopped cutting back/mulching because a local nursery suggested that practice is good for tea roses but not so good for the shrub roses. The nursery spokeswoman thought that our shrub roses should be much taller than they were, so don’t cut them back. Do you think there is a difference? I can also ask Jack that question. I don’t think you should cut back your shrubs. They do better when left larger! I have many old roses and I do very minimal pruning. David Austin English roses don’t like radical trimming either. In my zone 5b garden I wait until spring to do my pruning.